It’s been a good few years for actress Tiya Sircar. In 2016, she started her recurring role as Vicky (a.k.a. “Real Eleanor”) on The Good Place. 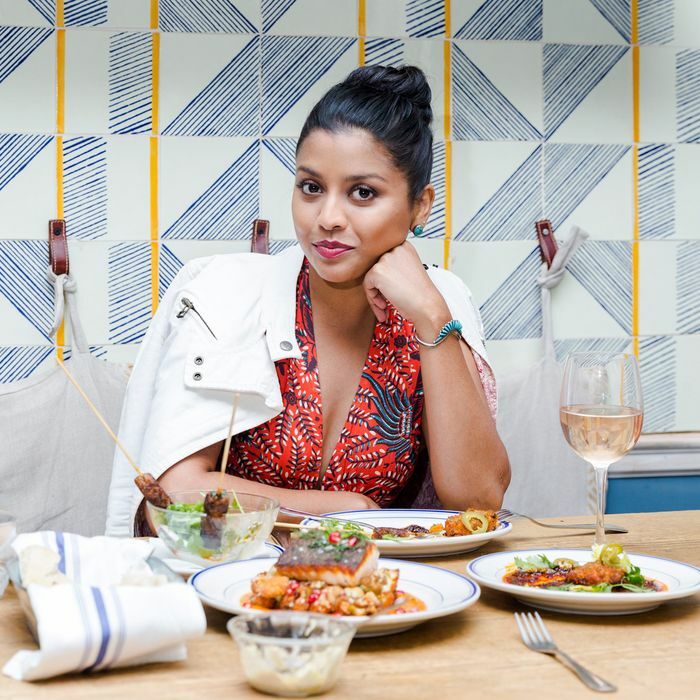 This year, she became the first woman of South-Asian descent to land a leading role on an ABC comedy with her turn on Alex, Inc., which prompted our friends at Vulture to call for “a show of her own.” Sircar was also born into a family of enthusiastic eaters, so when she’s not on set, there’s a really good chance she’s out eating. This week, she split her time between Los Angeles — where she got in ample grilling time — and New York, where she ate bánh xèo in Brooklyn. Read all about it in this week’s Grub Street Diet. I take full-body weight-training classes at a place called Novo Body in Encino, and you have to eat a little something beforehand or else you might pass out. This class is no joke! So about 30 minutes before, I had what I have every single morning: Bigelow Earl Grey tea with coconut creamer from Trader Joe’s and agave. My parents are from India, so I grew up with this tea culture, and tea time is a very big deal. It’s why I don’t wake up and drink coffee. Also, I had one slice of Dave’s Killer Bread — 21 Whole Grains and Seeds is my JAM — with some smashed banana. For lunch, I grilled asparagus, sweet corn, and an Aidells Habanero and Green Chile Smoked Chicken Sausage. My dad got me this amazing Char-Broil Tru-Infrared Grill as a housewarming gift — I bought the house a few months ago — and I try to use it as often as possible because, man, things just taste better grilled! I’m from Texas, and grilling is just a part of spring and summer back home. I like going to friends’ barbecues and things, but I’d never been a big griller myself until my parents got me this really nice, schmancy grill. Oh, and I love barbecue. I really like Bludso’s; that place is as close to really good Texas barbecue as I’ve found in Los Angeles. They have Shiner Bock on tap; it feels like you’re in Texas, all the fixings just feel right. When I need barbecue, I go there. I usually need a snack in the middle of the afternoon, but my lunch was pretty substantial so I was good until dinner. It was Friday, and on the weekends I like to take advantage of all the fantastic restaurants here in L.A. I ended up having dinner at one of my favorite sushi spots, Sushi by H, which is kind of a hidden gem. Well, I mean, the problem is it feels like a hidden gem, but there’s always an hour wait. And I never remember to make a reservation. I had a couple of pieces of shrimp tempura and salmon-avocado roll, some seaweed-and-cucumber-sunomono salad, and one piece each of snapper with salt and lime, uni, ankimo, ono, and seared albacore. Oh, and a little cold sake because, you know, it was the freakin’ weekend! I started the day with my trusty cup of Earl Grey tea with T.J.’s coconut creamer and agave. For breakfast, I had a homemade scramble with two cage-free eggs, red onion, cremini mushrooms, and spinach, along with a MorningStar meatless sausage patty and a tangerine. I eat meat, but am totally fine with swapping it out for vegetarian or vegan options from time to time. It’s better for my health as well as the environment, and I don’t mind it so … why not, right? For lunch, I whipped up a super-easy, fairly healthy white-bean hummus and had that with sliced Persian cucumbers, baby carrots, and Trader Joe’s Multigrain Pita Bite Crackers. This dip is my go-to when I throw parties and need an easy appetizer that I can make in no time. I just throw one can of (rinsed) cannellini beans in a food processor along with minced garlic, low-fat plain Greek yogurt, extra-virgin olive oil, salt, freshly cracked black pepper, and fresh juice from a lemon I get from the Meyer lemon tree in my backyard. You can add Italian flat-leaf parsley, but I’m not a fan, so I leave it out. As I said, I bought this house a few months ago, and thankfully there was this beautiful, very productive Meyer lemon tree. Now that I have that fruit tree, I’m like, Oh, what other kinds of trees can I plant? So I’m trying to scope out a spot for an avocado tree because I love avocados and I could eat them at probably every meal. Then I was thinking maybe I might try to plant a fig tree because I’m told they grow really well in Southern California. The Kentucky Derby was that afternoon, so in honor of that, I also had a celebratory mint julep that I made with Woodford Reserve bourbon and a lot of crushed ice. You can’t properly watch the Kentucky Derby without having a mint julep, and this is the first time I’ve tried making one at home. And it was, uh — it was fine. I probably need a little more practice. I don’t really make cocktails at home. I like trying interesting cocktails at restaurants and bars, but I am no good at that myself. I’ll leave it to the professionals. The weather is unseasonably warm in Los Angeles, and it felt like a balmy summer night even though it was only early May. So I ended up grilling again and inviting a couple of people over. I think grilling for one is excessive. Dinner consisted of salmon marinated in garlic, lime, olive oil, soy sauce, and red chili flakes; eggplant in olive oil and sea salt; and carrots I roasted in the oven and seasoned with herbs de Provence that I got from one of my favorite restaurants in L.A., Trois Mec. (It’s a treat and special-occasion restaurant for me. I love his food, but I don’t go there often.) The chef, Ludo Lefebvre, sends everyone home with a beautiful jar of dried herb medley after dining there. Such a nice touch! I took another weight-training class at Novo Body, so for breakfast beforehand, I had another slice of Dave’s Killer Bread with smashed banana. I find that eating carbs before a grueling workout gives me the energy I need to make it through all 60 minutes of class and give it 100 percent. (No, I don’t like working out. I just make myself do it.) And, of course, I had a cup of Earl Grey tea with coconut creamer and agave. After class, I drank the rest of my Zero Carb Protein Drink from Friday. I try to consume protein and amino acids within 30 to 45 minutes after working out to aid in building muscle and help my body recover. I had to get ready for an appearance on American Idol, so I grabbed a salad from Food Lab in West Hollywood to nosh on while getting my hair and makeup done at my house. They make a really nice niçoise(-ish) salad with tuna salad, mixed greens, green beans, fingerling potatoes, cherry tomatoes, black olives, and a hard-boiled egg, with a lemon-herb vinaigrette. After American Idol, I went to an adorable Italian restaurant near my place, Ca Del Sole. I drank a glass of Pinot Noir — I like a lot of different types of red wine, but find that I always enjoy Pinot Noir, especially if it’s from Oregon, specifically the Willamette Valley. To start, I had a salad with raw baby artichoke hearts, wild arugula, lemon vinaigrette, shaved Parmesan, and freshly cracked pepper. For my entrée, I went with their zuppa de pesce, which is a cioppino made with spicy tomato broth, garlic, some white wine, and tons of seafood, like sea scallops, mussels, clams, salmon, and shrimp. Delicious! I had to catch an obscenely early flight to New York — 5:45 a.m. takeoff! Ouch! — so I grabbed breakfast at the airport. Luckily for me, there’s a Lemonade in the JetBlue terminal. There are several Lemonade locations all over L.A., and I often stop there when I’m out and about and want something quick and healthy. That morning, I got an egg-white frittata with spinach and mushrooms that came with a side of roasted potatoes, a side of berries, and a Fiji water. By the time I arrived in Brooklyn, I was starving. It was a beautiful day, so I walked along Prospect Park to a cute little place called Krupa Grocery. I had a couple of photo shoots the next day, so instead of getting the panko-crusted-shrimp burger with seaweed salad and Korean pickles like I desperately wanted (it’s delicious, but pretty decadent), I opted for the charred Montauk squid and fennel salad with frisée, citrus vinaigrette, and sunchokes. It was light and refreshing, just what I was looking for. Dinner was with my sister, brother-in-law, and baby niece who live here. They took me to a cute Vietnamese restaurant in Brooklyn called Ha Noi, and we had bun with grilled shrimp, vermicelli noodles, and pickled vegetables; Vietnamese spring rolls; and a delicious pork-chop dish that came with rice and veggies. We also had one of my favorite dishes that I discovered on a recent trip to Vietnam: bánh xèo. It’s this crispy crêpe stuffed with shrimp, bean sprouts, onions, and maybe some other vegetables that you wrap in a lettuce leaf and dip in a tasty sauce before eating. Their version was almost better than what I had in the actual city of Hanoi, which is pretty impressive! Eating and traveling are two of my passions in life. I’m Indian, specifically Bengali; my parents are from Calcutta. Gastronomy is a huge deal in Bengali culture, and Bengali cuisine is very special and unique. As a family, most of our meals consist of planning and plotting out what our next meal is going to be. I know there are people who have a go-to place or go-to dish and feel comforted by that, and I’m totally the opposite. I have very few places where I frequent and get the same thing. I come to New York often for work and for pleasure, and it’s … New York City. I feel like if I had one place I went to all the time, I’d be missing out on opportunities to discover interesting dishes and new places. I had a fairly early call time for a photo shoot for Elle India this morning, so I grabbed a piece of multigrain toast with some all-natural almond butter and sliced banana for the road, and, you guessed it, a cup of Earl Grey tea. This time, I had it with some agave and a splash of 2 percent milk, since I was traveling and didn’t have access to my usual dairy alternative. My lunch today was pretty stellar! I had to do the photo shoot for this Grub Street piece at a lovely restaurant called Claudette. It has a wonderful ambience, and the Provençal–slash–North African–inspired menu items are unusual and super delicious. The chef kindly sent us some of his favorites: truffle hummus with pita; sweet-potato falafel with housemade harissa and pickled chilies; cucumber and tomato salad with fresh herbs; lamb-kefta skewers with za’atar, ginger, and arugula; crispy-skinned salmon with charred cauliflower and pomegranate; and a vanilla crème anglaise and cappuccino for dessert. So much more food than one person should consume in one sitting, particularly at lunchtime, but it was too delicious; I couldn’t say no! Later in the evening, I met some friends at Soho House in the Meatpacking District and we shared a couple of pitchers of spicy margaritas. Also, some small plates of meatballs, deviled eggs, avocado toast, fries with aïoli, and a delicious octopus dish served with couscous. After a particularly filling lunch, I wasn’t in the mood for a full dinner production.